Amos Decker and his FBI partner, Alex Jamison are ostensibly on vacation, visiting Alex’s sister whose husband has just been transferred to Baronville, Pennsylvania. Sister Amber has a daughter, five-year-old Zoe, who gives Decker’s heart a pang every time he looks at her because she makes him remember his own daughter. It’s while being entertained by Zoe, that Decker notices something odd going on in the house next door, a house supposedly unoccupied. He goes to investigate and walks into the mystery that turns his vacation into a busman’s holiday of death. There are two bodies in the house, and the causes of death are not only suspicious but downright mysterious. They aren’t the first to recently die in Baronville, either. There have been a total of six deaths within a short period of time which is six too many for such a small town. “Six murders, four of which involved unrelated parties. Baronville was in the grip of the opoid crisis terrorizing other areas of the country. Baronville is a place about to dry up and blow away, in spite of the opening of an order fulfillment center. People are dying right and left, mostly drug-related, with million-dollar insurance payouts that don’t explain how such poor people can afford such high premiums. No matter the cause, however, everyone blames the Baron family for the problem. The rumor that there’s a fortune buried on the Baron estate doesn’t help. It doesn’t matter that the last living Baron is existing like a squatter in his own home, almost penniless and destitute. Soon Decker and Jamison are up to their necks in drug trafficking and treasure hunters as well as dead bodies, two of whom nearly become their own. Escaping but severely shaken, Decker finds his total recall and its accompanying synesthesia affected and now faces the fact he may lose some of the abilities making him such a good investigator. When death strikes the Mitchells and Decker sees its effect on little Zoe; however, he responds to the child’s grief, trying to help her understand that death may take a person away but he can stay alive in the heart. Then John Baron is accused of the murders and the evidence is just too good to be true. Through a twisted tale stretching back four generations but reaching into the future to combine with the current drug epidemic attacking Baronville, Decker and his partner will discover and discard motives until they find the one answer that can’t be disproven. This story takes a bit different approach to Decker’s character, in that it shows him not only as the Memory Man but also a man concerned with a child’s welfare. Projecting a bit of his lost daughter onto little Zoe Mitchell, Decker momentarily becomes a father by proxy, overcoming the quirks in his brain preventing him from responding appropriately in certain situations, to help the child contend with her loss. He’s also now facing the fact that the injuries he sustained in the current case, coupled with the concussions suffered during his NFL days, may now backfire and change the abilities he’s coped with for so long, perhaps causing diminished capacity or replacing them with new capabilities. The story itself is full of twists and turns and unexpected revelations. Unlike some novels, there’s no long build-up before the action starts. After a brief introduction to get the reader oriented to when, where, and why Decker is as he is, the mystery immediately starts. By page six, both reader and FBI consultant are up and running, directly into 432 pages of mystery, murder, soul-searching grief, and startling revelations. 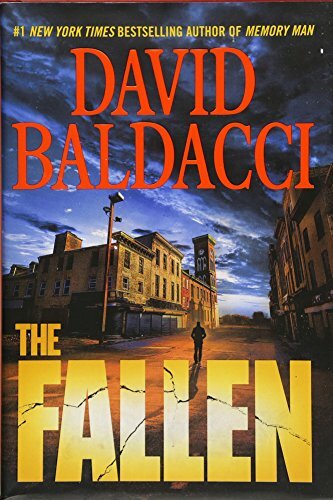 Amos Decker novels just keep getting better and better, and it’s partly due to the careful in-depth characterization Baldacci gives his main character. The Fallen is another winner in this entertaining series.